In every major (and not only large European city) has a lot of sculptures, monuments, elements of decor and so on. And Copenhagen`s town hall Square is something really special. Therefore, the Town Hall and its adjoining area I want to describe specifically. First, a little background information. 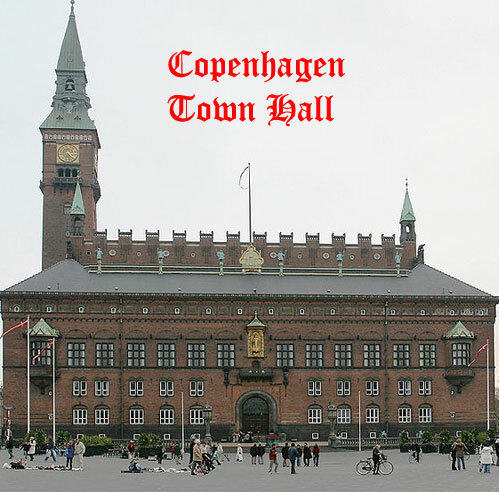 Copenhagen City Hall (Københavns Rådhus) - an office building, the seat of the Municipal Council and Mayor of the Danish capital. It is built in the center of Copenhagen in the years 1893-1905 (Architect - Martin Nyrop). It is believed that the building combines elements of Romanticism, the Danish Middle Ages and Northern Italian architectural elements. The architectural style is called "Northern Art Nouveau". Height of the clock tower reaches 105.6 m still is one of the tallest buildings in Copenhagen. The coat of arms of Copenhagen was founded in 1661 the king of Denmark, Frederick III, as a reward to citizens for worthy sustain their heavy siege and storming of the Swedish troops in 1658-1659 gg. For a basis of the emblem was taken symbol in the city of printing with 1296 year: city tower, standing above the water, symbolizing the harbour, is present in the name of a city - Havn. Cobenhavn - merchant harbour. Frederick III placed on the arms of the three towers, making in average gate, which protects the knight with the sword. The Central tower is derived the gold monogram of Frederick III. Entrance to City Hall is free. Visitors can climb the tower and see Copenhagen from above (300 steps, the height of 105 m). Seemed to me an interesting stamp stained glass window over the front door (which can be seen only from the inside). The Coat of Arms emblem there is also an outside, and indeed outside the town Hall there is something to look closely. 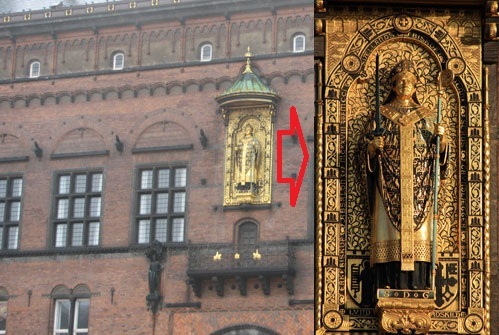 For example gilded statue of Bishop Absalon, founder of Copenhagen (1167). At City Hall, you can easily recognize the Absalon, as he dressed in bishop's robes. Only the sword in his right hand somehow dissonant with the image of a Christian pastor. But for the Western church is not dissonance. 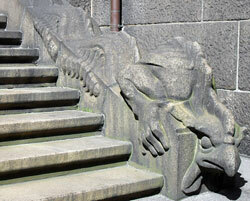 Relatives of these dragons (only without the horns), there are in the inner courtyard of city Hall. They were crawling on the wall of the stairs with a very strange view. 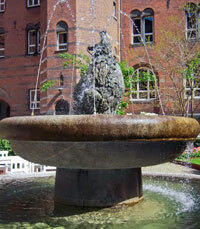 I suppose they want to drink, because in the center of the courtyard is a fountain. This fountain is located under the protection of the terrible bear. 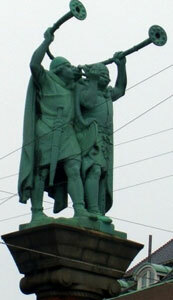 Two trumpeter Vikings blow into a tube, which is called "Lure". Tapered shaft is bent in the form of the Latin letter S. Lura length and a half to two meters. Cup-flat trumpet decorated with geometric patterns. To lure you can extract only the sounds of the natural scale. Was common in Scandinavia (in today's Denmark, Sweden, Norway, the northern parts of Germany) in the late Bronze Age (between the XII and VI centuries BC). Depending on the nature and mood of the guide, you will be told one of two legends about these bronze Viking troubadours. The first - a strict and formal: they shall blow when Denmark will be in danger of death, the sound will wake Lure hero Holger sleeping in the castle of Kronborg, and he will save his land. The second - in the spirit of Copenhagen pranksters: Lure sound you hear when on the Town Hall Square will be an innocent girl. One way or another, but for the past hundred years are silent Lurs Vikings. 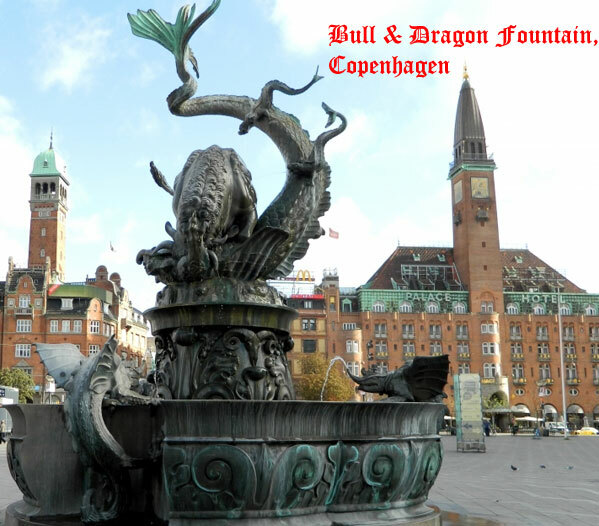 Fountain "Bull rent the Dragon" was set in 1904, the authors - architects Orvald Vindesbol and Joachim Skovgard. They say, initially, as expected, the dragon had to fight Saint George. But when Skovgard sick and lying in bed, he looked at the room wallpaper with streaks of water that formed the figure of a bull on the wall. This led him to a new and unusual idea fountain. 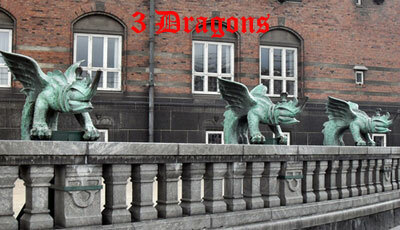 Have A Great Story About Copenhagen`s Town Squere?